US-facing site, Americas Cardroom, has been in the headlines over the years. They reintroduced frequent $1 Million guaranteed tourneys to U.S. players, and are known for running huge tournament series in general like their recently-completed $8 Million OSS Cub3d. Now, Americas Cardroom is making headlines for another reason. 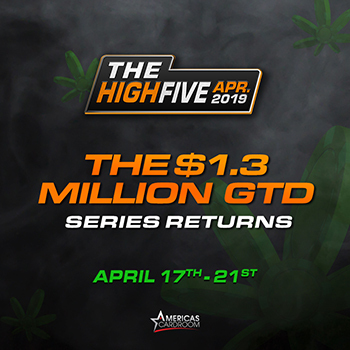 Their High Five Tournament Series returns April 17th-21st with $1.3 Million in guaranteed prize pools, but it’s the underlying theme that is turning heads. You see, the High Five is a 420-friendly series. That means there are lots of marketing slogans like “smoke the competition”. There’s also a daily 10-minute “courtesy break” at 4:20pm ET, to use any way you want! While all the 420 stuff is amusing, we prefer to focus on the action on the felt. There are five added tourneys per day (25 total). The $420,000 GTD Main Event comes on the last day at 4pm ET. It has a buy-in of $420+30, but you can qualify for far less via satellite. Also on the docket at Americas Cardroom is the $5 Million Venom this July. It has a $1 Million first-place prize and will be the biggest tourney ever hosted by a US-facing site. New to Americas Cardroom? Their 3-part Welcome Package includes a 100% First Deposit Bonus up to $1,000 (200% if you use a crypto), up to $50 free cash, and New Depositor Freeroll Access. For the full High Five tournament schedule, visit here.